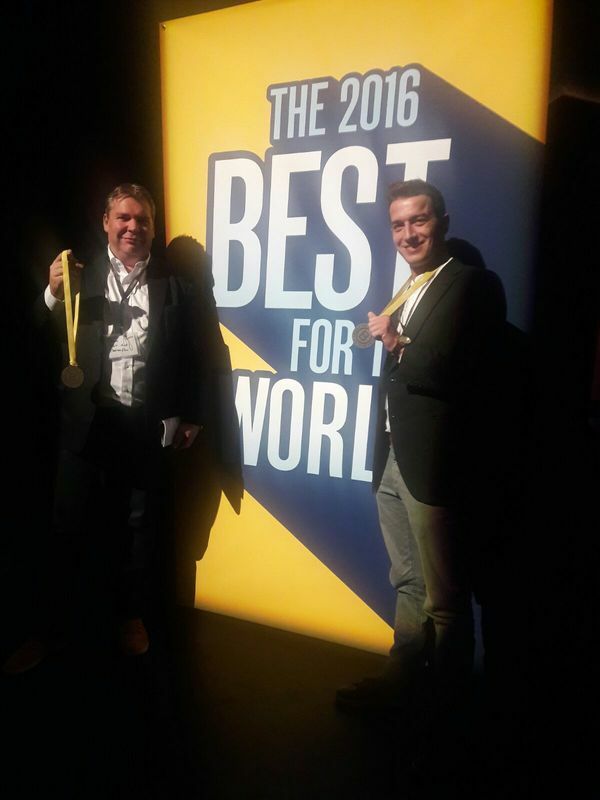 Yesterday, Thermaflex North West Europe, was recognized for creating the most positive environmental impact by the international non-profit organization, B Lab, on the annual ‘Best for the World’ nomination. This nomination honors businesses that belong to the top 10% of the 1800+ Certified B Corporations from 50 countries and 130 industries worldwide. B Corp is to business what Fair Trade is to coffee. Starting in 2006, the B Corp movement boards for-profit companies to meet rigorous standards of social and environmental performance, accountability, and transparency. The B Corp vision entails that one day all companies compete not only to be the best in the world, but the best for the world, leading to more shared and durable prosperity for society as a whole. In the founding class of B Corp Europe, Thermaflex North West Europe was B Corp certified in early 2015 for our social and environmental impact, accountability and transparency through the B Corp assessment, which evaluates how practices impact employees, customers, communities, and the environment. In our ambition to become a global B Corp, this year Thermaflex Central -and North East Europewere the next two regions to become B Corps. The B Corp 'Best for the World List' sets the gold standard for high impact companies, assessing a total of 1,800 Certified B Corporations from over 130 industries in 50 countries, all unified by one common goal: to redefine success in business. We are thrilled to receive the ‘Best for the Environment’ award, as it greatly underwrites the Thermaflex mission and values. This was also affirmed last year, when we were already among the top 10% of the (then) 1,200 B Corps, and ranked by Forbes magazine as one of the top 14 companies considered to be ‘Best for the Environment’. In our markets, numerous developments underline our drive to make a positive impact, such as our continuous improvements on the energy performance, material health and recyclability of our solutions, sealed through Cradle to Cradle certifications. We also recently launched a reclaim program to take back all residual product wastes and recycle them into our production process. Also in our own organization, we run various in-house programs to minimize our environmental impact. In Europe, 95% of the energy use of our facilities comes from renewable sources. Quality assurance and environmental management systems are implemented to continuously monitor and improve operational processes, which led to a 20% overall score improvement in our recertification this year. We also get to elevate our influence on a consultative level. March this year, Thermaflex was invited to make an active contribution to the strategic implementation of the United Nations District Energy in Cities (DES) program, as one of the 14 private companies to play an advisory role alongside governments and civil society associations to facilitate energy efficiency and renewable energy through the deployment of modern district energy systems. We are also active in other strategic initiatives of the UN Environmental Program (UNEP), such as the Gobal Alliance for Building and Construction (GABC) that was formed to help realizing the COP21 goals of late December. “The certification of our benefit model through the B Corp framework is not only a great honor and tribute to our efforts, but also provides guidance, focus and partnerships in achieving our dream of a sustainable future for generations to come” Gerrit-Jan Baars, our CEO and key inspirator, proclaims.